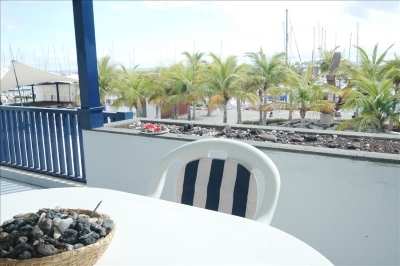 This apartment is situated on the 1st floor and enjoys views of the ocean and the Puerto Calero marina. The views are truly spectacular as the apartment is right on the sea front. It has a large covered sun terrace. There are two bedrooms and one bathroom. The interior of the apartment is very spacious and airy. There is an open plan lounge with comfortable sofas and a flat screen TV as well as a dining table and chairs. The small kitchen is very well equipped and even includes a dishwasher as well as a microwave and coffee maker. The two bedrooms both have 2 single beds and fitted wardrobes. The bathroom has a bath with shower overhead, twin wash hand basins and a toilet. The nearest restaurant is 10m away, and the supermarket is only 20m. The beach is 3km and the airport 15km.